This is a wonderful antique Walnut veneered box, suitable for both a male and female. 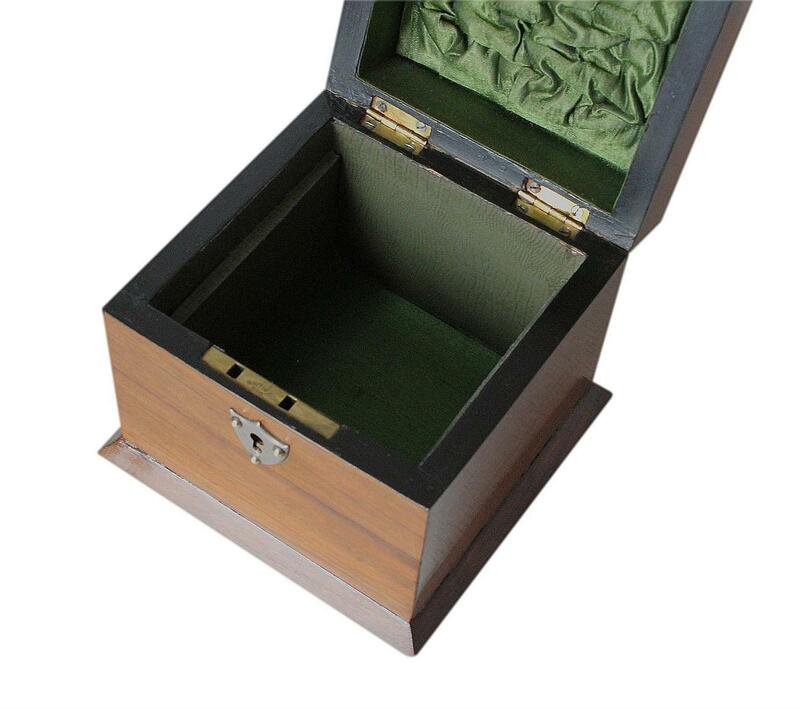 It was originally made to store both a pocket watch and jewellery. Its interior and exterior are completely original. This box has a superb figured Walnut veneer. 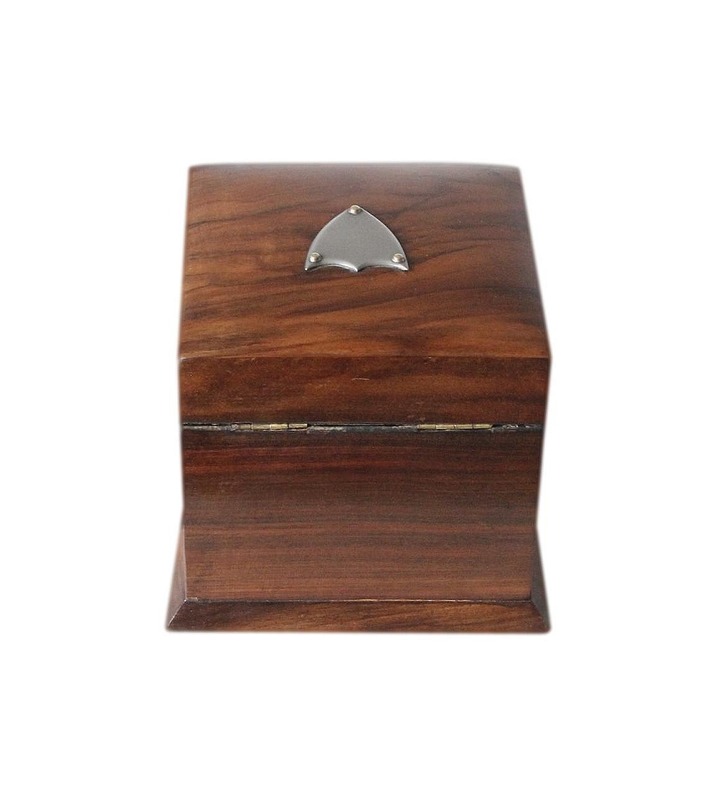 The Walnut has a wonderful rich colour and a beautiful high polished finish. It has a lovely sheen and tactile smoothness. The lid has an excellent polished white metal shield cartouche and there is a complimentary white metal shield escutcheon to the lock. Both of these are securely attached with their original gold metal pins. 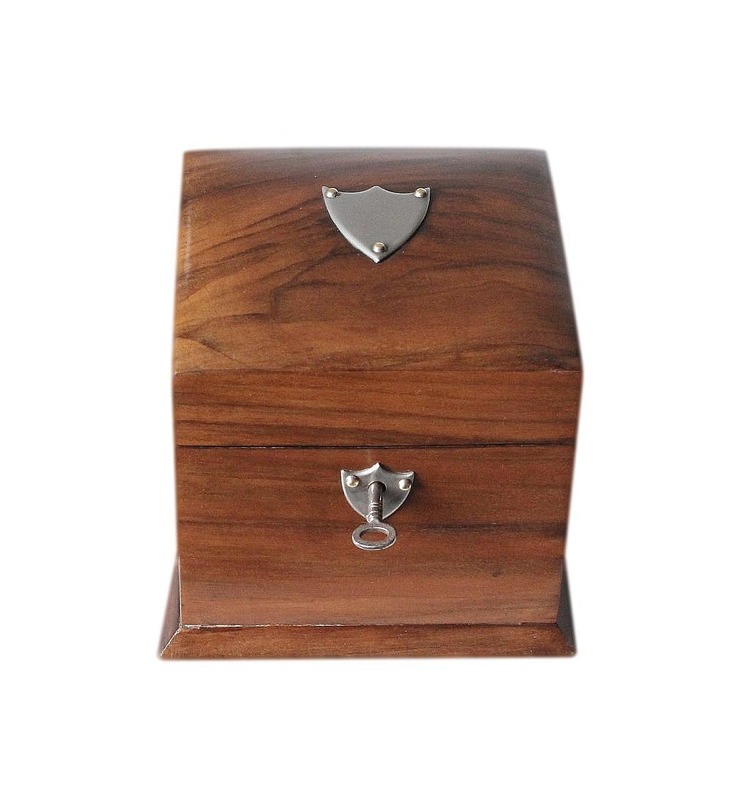 The cartouche is blank and can be personalised with an engraved name, initials or date/s etc. Key Cutters or Jewellers usually offer engraving services. 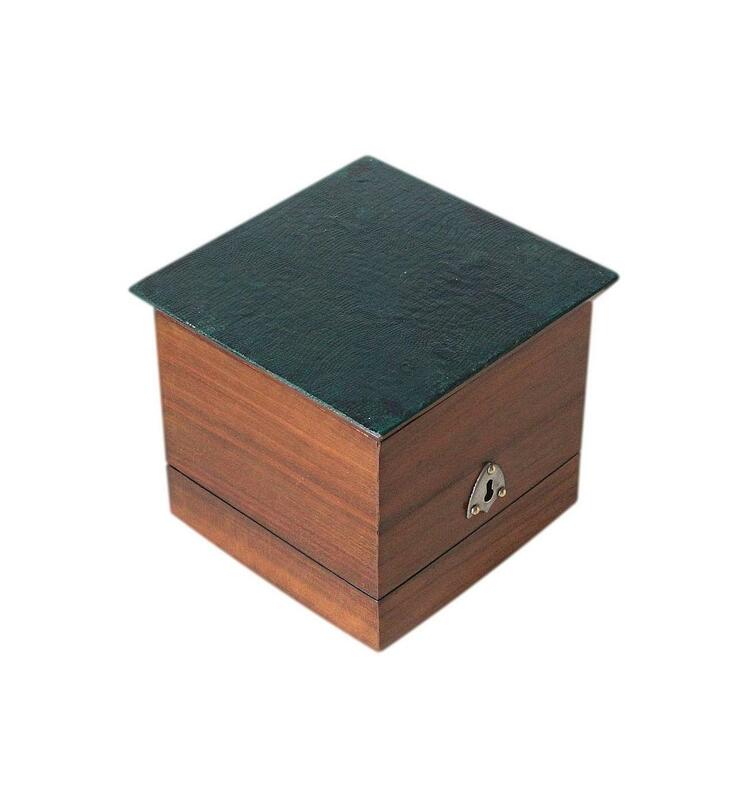 The lid has a lovely shallow domed form and the box has a stylish plinth base. 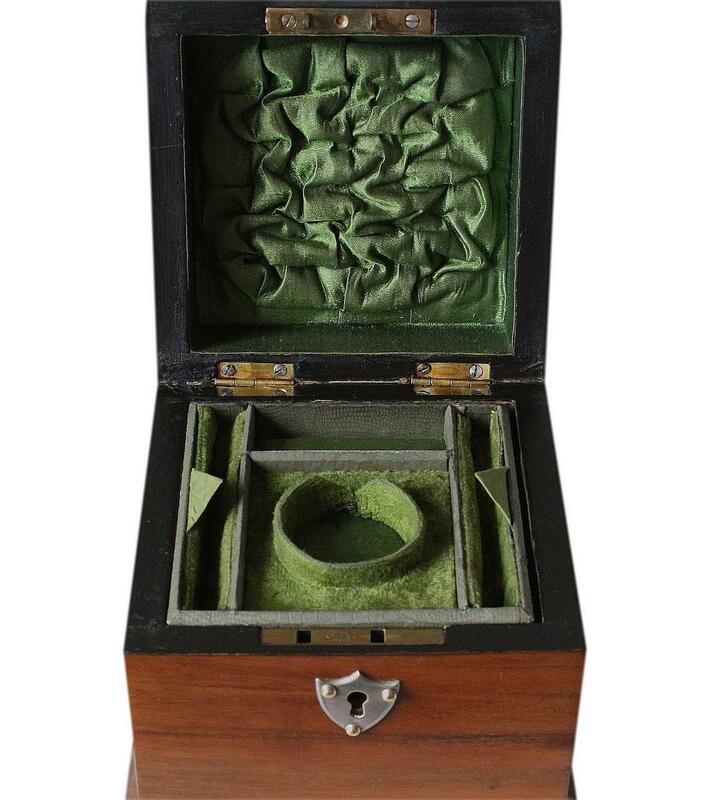 The box is complete with its original working brass lock and key. It also has its original brass stop hinges which hold the lid upright. The bottom of the box has its original vinyl covering. This is textured and has a crocodile skin effect. The interior has its original removable storage tray at the top. This has two compartments plus two ring storage sections. The centre front compartment has a circular ring that was originally designed to hold a pocket watch. This can still be used as intended or alternatively used to hold a pendant or locket. There is a lovely cut section to the circular ring. This allows an attached chain of a pocket watch or pendant to be laid out upon the tray surrounding it. The little narrow compartment to the rear of the chain is an ideal size for small pieces of jewellery such as earrings, small pendants and cuff links. 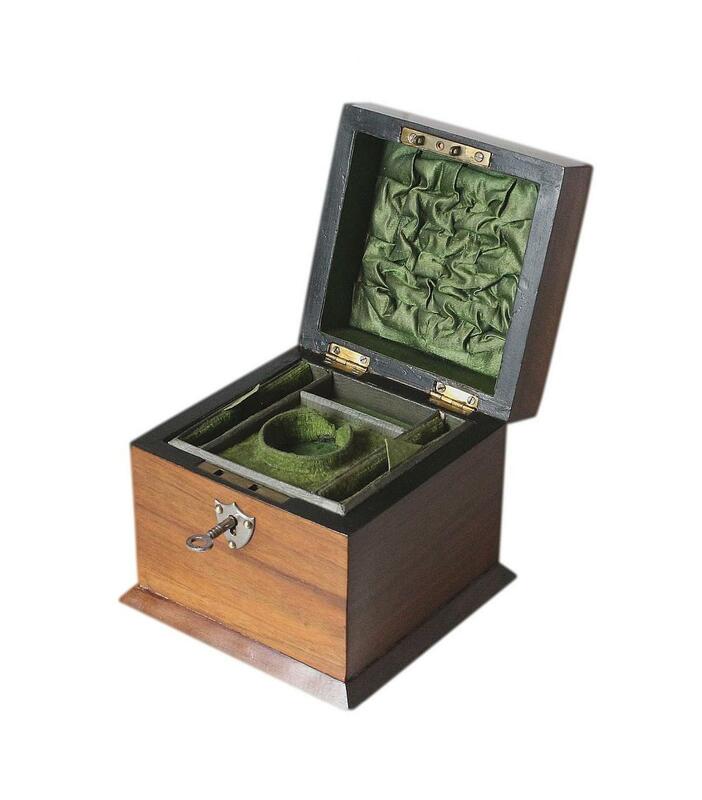 The tray is complete with its original silk and velvet linings and silk pull tabs. Its edges and exterior walls and base, have their original paper coverings. These compliment the covering on the bottom of the box. Beneath the tray is a further larger single compartment. This can hold a small collection of jewellery and is deep and roomy enough for a bangle or wrist watch. The base of this compartment has its original silk lining and its walls have their original paper linings. The paper matches that on the tray. The inside of the lid has a beautiful padded, ruffled silk panel, and its walls have silk linings. All original again. 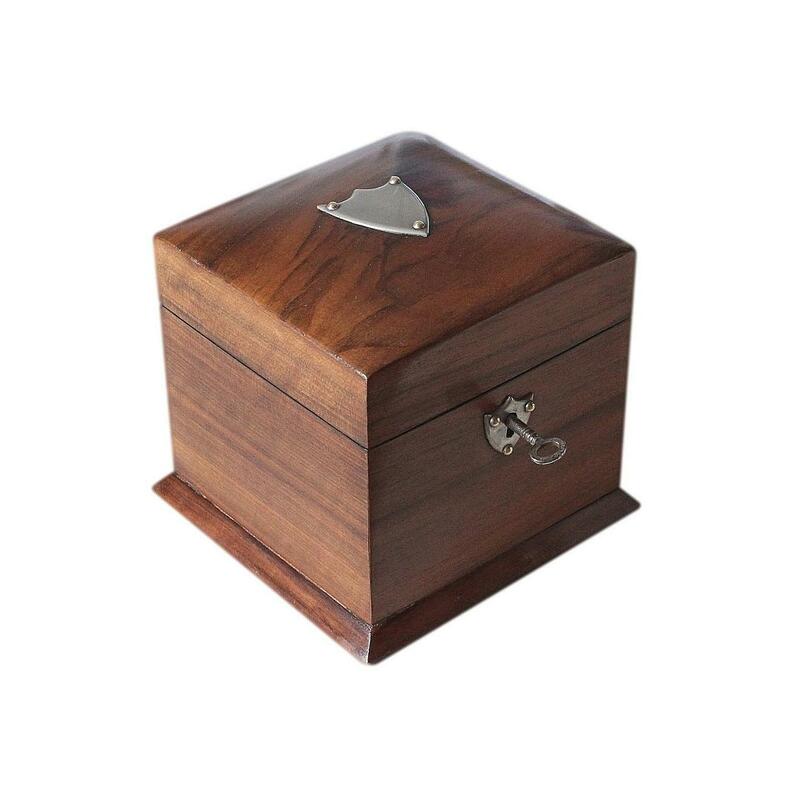 This wonderful box is in superb condition with no knocks or obvious scratches. All of the beautiful Walnut veneer is present and intact. The interior linings and coverings are lovely with no stains, splits or fraying. The covering to the bottom of the box is in remarkably good condition, just minor light age related/friction wear. The hinges are still in excellent working order and the box locks securely. We would like to make you aware that antique locks can occasionally malfunction. They are already very old and will naturally have some wear from age and use. We are not responsible for locks that malfunction from further age and use once boxes are purchased. Please ensure the lock is still working as soon as you receive your box. 7.0 by 6.2cm with an 8mm depth. 3.8cm diameter with a 1.5cm depth. 6.2 by 2.2cm with a 1.5cm depth. Each hold 3-4 rings dependent on their size and shape. 10.3 by 9.4cm with a 6.3cm depth.